When's the last time you visited a national park? If you're African-American, the answer is likely to be "never." According to the National Park Service, only 28 percent of visitors each year are people of color. The U.S. Fish & Wildlife Service says that 96 percent of all hunters, 93 percent of wildlife watchers and 92 percent of anglers were White in 2006. And the Outdoor Foundation contends that 70 percent of outdoor recreationists are White, across all age groups. Why don't Black people make those summer pilgrimages into the woods, or visit the "purple mountain majesties" of America? There may be some truth to the theory that African-Americans just don't find tramping through trails or camping in quiet forests fun, given the terror that historically awaited us during centuries of slavery and Jim Crow. But I'm not sure that's the whole answer. After all, African-Americans tamed this land with their bare hands and hunted and fished. We knew the woods well enough to navigate them on our journey to freedom. Not to mention, we have always been farmers, sailors, ranchers and cowboys. In fact, more than 100 years ago, the superintendent of Sequoia and General Grant (now Kings Canyon) national parks in California was an African-American. His name was Col. Charles Young, a captain of the celebrated Buffalo Soldiers. "Buffalo Soldiers" was the nickname Native Americans gave to the 9th and 10th cavalry regiments of African-American soldiers, many of whom were Civil War veterans. Between 1867 and 1898, the Buffalo Soldiers served in the Indian and Spanish American wars. Noted for their bravery and discipline, they fought in nearly 200 engagements across the West and collected 14 medals of honor. In 1903, Young and his men were sent to the national parks to protect the pristine land from environmental damage by ranchers and poachers. When Young was named acting superintendent, he became the first African-American to supervise a national park. This deep connection between the American landscape and Black history was lost when Blacks migrated North, says James Mills of the Buffalo Soldiers Heritage Center in Rouge Park. He believes that African-Americans don't visit national parks not because they're afraid of racial violence in the woods, but because there's little opportunity for engagement with nature in urban centers. "We were crammed into segregated neighborhoods in the North," he says. "They didn't lack interest, they lacked exposure." But Mills, 75, counts himself lucky. "There was a guy who raised show horses right in my neighborhood," recounts Mills, a native of Detroit's North End. "I would go to the stables to clean and learn to ride." The experience was transformative. "Something happens to kids when they are exposed to something besides dogs," says Mills. "It even changes the way they connect to people." Mills spent years as a biomedical engineer at Hewlett-Packard but never stopped riding and raising horses. When a friend told him about a group that preserved the history of the Buffalo Soldiers, he was intrigued. For 28 years, Mills has dedicated much of his time to preserving the history of the legendary regiments—and introducing metro Detroit children to the mutual history of African-Americans, nature and the settling of the West. 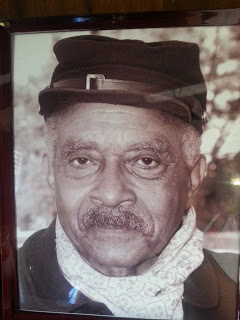 I've met him in the past where the Buffalo Soldiers were part of re-enactment events. My children were wide-eyed to see Black men in Union uniforms galloping on horses. Today, Mills is first sergeant of the Buffalo Soldiers Heritage Center. 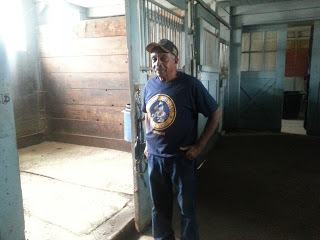 I found him there recently, where he keeps a small archive of Buffalo Soldiers memorabilia and runs a private stable of seven horses, including two of his own. "I have young people who have been coming here to visit us for four or five years now," says Mills. The center, operated in conjunction with the Detroit Recreation Department, is open noon-5 p.m. daily "The key to getting more young people involved with our parks and the outdoors is simply exposure. Someone out there has to keep planting those seeds." For now, that someone is Mills, whose life is dedicated to a critical message to African-Americans—this land is our land, too. 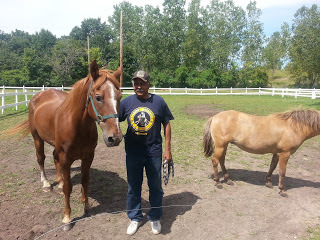 Visit the Buffalo Soldiers Heritage Association at 21800 Joy Road in Detroit's Rouge Park. BuffaloSoldiersHeritage@gmail.com or 313-270-2939.